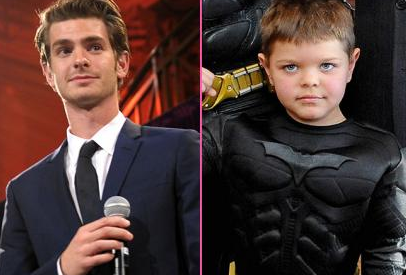 According to the New York Post Page Six, Andrew Garfield did not make Batkid's dreams come true. According to the story, Andrew Garfield was supposed to present at the Oscars with the 5 year old kid with cancer the entire world knows as Batkid after being granted a wish in San Francisco. (Last year the city played out a crazy scene and he was in custom. Hearts melted etc.) Anyway, Garfield supposedly didn't like the lines he was given and tried to change them. The producer didn't like the changes, Garfield had a hissy fit and they had to replace the bit with Chris Evans - Captain American to the rescue. OK, so question. Why couldn't Chris Evans have stepped in and done what Andrew Garfield was supposed to do? I mean, it is not that hard to write a two second bit. All people are going to be doing is looking at the kid anyways. I'm not sold on this story. Something is off. But I'm glad to hear Batkid is still fighting the good fight.